I happened to be in Kuala Lumpur last Saturday and since it was the eve of Mother's Day, decided to celebrate the occasion with my siblings. So, four of us trotted off to The Lobsterman @ SS2, Petaling Jaya for our dinner. I've heard of this seafood restaurant but have not yet tried their goodies. It was indeed a very sumptuous meal, a bit on the high side though, but nonetheless we mothers should pamper ourselves and indulge, once in a while, what more as it's Mother's Day! This is part of the menu and there are also pictures to show you how to 'tackle' the lobster with the 'tools' provided on the table. Each of us ordered a 800 gm lobster @ 118 ringgit. There are other sizes at different prices. Lobster Thermidor (Italy) ~ Fresh lobster meat sauteed with white wine sauce and baked with cheese, Mama mia! This is Steamed Lobster (China) ~ Steamed lobster in a choice of sauces, deep fried garlic, raw garlic, ginger and spring onions or Chinese wine and this is with deep fried garlic. Whole Lobster Salad (Global) ~ Fresh lobster meat dressed with a sauce of Tossed or Caesar salad. This is a 'smart' order or you can all it 'lazyman's choice ......... you don't need to soil your hands breaking up the pincers, etc. but this is the last to arrive as time is needed to remove the shells and dressing up the dish. Now, this is my choice ~ Char Broiled (North America) ....... Char broiling or grilling is just as great to savour the North's way of serving lobster. The meat was so fresh ...... succulent, juicy and chewy. It was just wonderful! Action ...... just can't wait to 'attack' the yummy dish! That's my other half, rushing me to quickly snap the photo! Part of the interior of the restaurant ...... simple and neat decor. The bill came up to Rm 547 plus taxes for the 4 of us but we went home, fully satisfied as we had thoroughly enjoyed ourselves tremendously. Just wondering when will be my next visit, slurp!! wow ... I wish I dined there with you! I love lobster, these lobsters look so delicious. Must visit this place when I'm in KL. The Lobster Thermidore and grilled looks the best. I can't believe how large they are. That's so nice you all had such a good time. Angie, are lobsters expensive in your area? Anncoo, indeed they are. Compared with your S$, this is pittance! Lyndsey, one 800 gm lobster is enough for one person, we didn't order any side dishes. It's filling. tracieMoo, yes they're pricey. 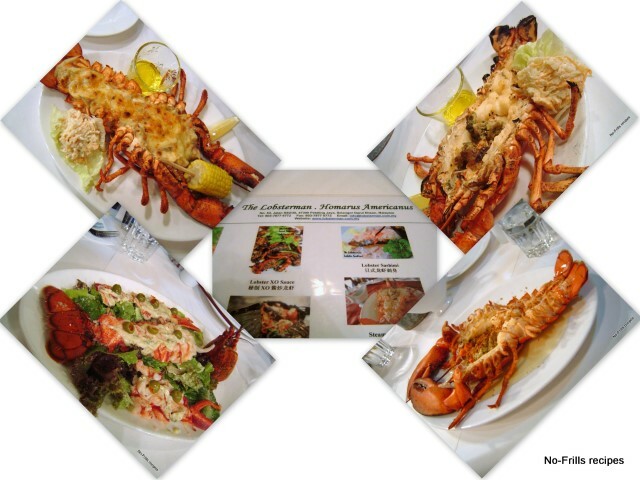 On CNY I had one lobster thermidore at Jake's Chargrill, cost Rm250! I nearly fell off my chair, of course they'll say that CNY prices are higher but then I was not served the whole lobster with pincers and all, they were missing! This is more value for money compared to that one. Yes, you should, Jeannie. Wedding anniversary, birthdays are excuses for you to indulge. Work so hard, must also enjoy a bit. I had lobster served in cold dish but I think I prefer to have it in baked cheese! That look pretty mouthwatering. Sounds like you had a wonderful time. Mmmm, mouth watering lobster. It has been quite some time since I last ate lobster! A wonderful treat for mother's day! Oh yes, I had a wonderful time, Kristy. Pete, go treat yourself on Father's Day, you deserve it! How many lobsters? What a lovely treat. This is a wonderful treat for mother's day, even I stay near this area, but I did not know this restaurant, must ask my hubby to bring me there in one special day. penny, 4 lobsters, one each. Mary, what a waste! You can google and watch how to cook a lobster on youtube. I saw it once. Sonia, please go and try it out at this restaurant, perhaps on 'Father's Day'? You'll enjoy it for sure.